Lyric has no idea that there's a realm outside the human one she lives in. When fate and circumstances are pulled from her hands after an accident, she finds out that nothing is as it seems. 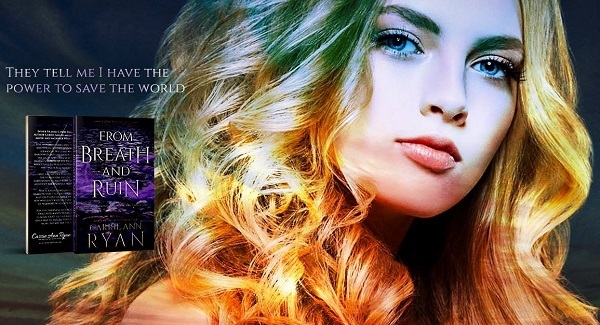 War is raging around her, and when Lyric realizes that they are searching for her, she must rely on those she once trusted as she trains: a boy who isn't who she thought, and a new realm of warriors who have come to protect her. For the darkness is coming, and the Queen of Obscurité wants to ensure that the King of Lumière can't get his hands on Lyric. And the only way to ensure that is if Lyric herself is no more... no matter the cost to prophecy. Carrie Ann Ryan is a new-to-me author. 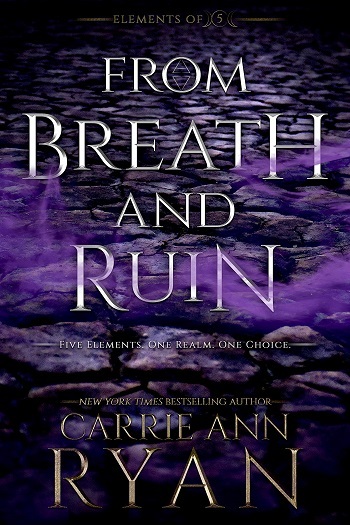 From Breath and Ruin is the first installment in the Elements of Five series. Even though Lyric is eighteen, on the cusp of adulthood between high school and college, it easily fits into the Young Adult genre, suitable for those 12+. Lyric is an adult, the genre is young adult, but I feel younger teens would enjoy this book the most. Coming-of-age, Lyric doesn't know what she wants to do with the rest of her life, finding the pressure of making life-changing decisions suffocating. How at eighteen, with no experiences, is Lyric to know what major in college she should choose? She's never excelled in anything, but been good at academics, so it's not as if she can play into her strengths. I felt this would be a comfort to younger readers, as well as resonating with older readers, as most of us have been in such a state of terrifying indecision. I did struggle at the start of the novel (the first 20% or so), as it was laden with inner monologues about the state of her life, her controlling ex now being her friend, and the dreams. Her indecision resonated with me, the fear of her dreams evoked real emotions within me, but Lyric also came off as a Suzy do-gooder, who never made mistakes, did as she was told, and that comes off as both judgmental in its goodness by comparison, as it does boring. Mousy generally doesn't lend well to a strong heroine. I couldn't wrap my mind around Lyric calling Rhodes 'dreamy,' since that's phrasing someone over 70 used in their youth. I also never had Lyric firm in my mind. At one point, I thought Lyric was described as being shorter and overly curvy, which I took to mean a bit chubby. I was thrilled by this and being bisexual, as both aren't often used to describe teenage girls in the young adult genre. She describes herself as not being athletic, yet she runs continuously as a hobby. A large portion of the beginning quarter of the novel focused on Lyric jogging. While I knew what color and type of sports bra she had beneath her tank tops and windbreaker, I never got an accurate image of the heroine affixed in my head, as what I thought she would look like contradicted other descriptions. Lyric has dreams, nightmares really, that show her insight into her life that has been kept from her. As usual in the young adult, fantasy genre, Lyric doesn't know she has powers, thinking herself below average, not knowing how she fits into the world, but then finds out she is rather extraordinary instead. The boy (even though Rhodes is over 21) is the one with the information Lyric needs. Where I had issue with the magic system and world-building... it was glossed over, same as with Lyric's appearance, the characters' personalities jumping all over the place, and their motivations were muddy, yet I can remember what foods were in the burritos, washing of the sheets on a daily basis, the color and material of the sports bras, the number of tank tops beneath the highly detailed mesh windbreaker, the color of the leggings, and the type of shoes. What I needed explained never was to my satisfaction. From a young adult's standpoint, no doubt they will be intrigued and find enjoyment in this novel and the series. I do believe the plot, the way the characters interacted with one another, this is far younger than the 18-20+ age-range of the characters, more like 12-14 in their behavior and dialogue. I did struggle with this, as it didn't read as adults in the novel – I wish their ages had been nudged to be younger. Writing this review from my adult standpoint, I must admit I didn't enjoy this as much as I hoped I would. In a nutshell, everything felt forced. The flow, the direction the plot took, the connections the characters had with one another, all of it felt forced. While I do recommend this novel to young adults, I'm not sure how it will be received by adults. I won't be continuing on with the series. 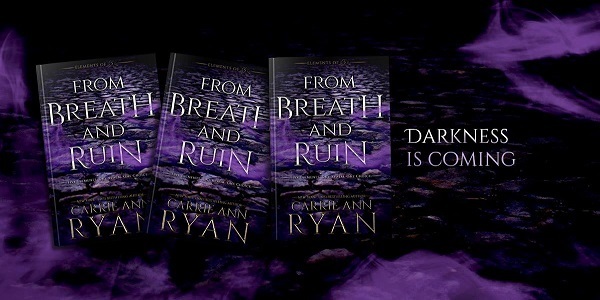 Reviewers on the Wicked Reads Review Team were provided a free copy of From Breath and Ruin (Elements of Five #1) by Carrie Ann Ryan to read and review for this tour.